The former Liberal Arts building on the Marygrove campus. Space in the building will be renovated for student and faculty use. Organizations gathered at the Marygrove College campus today to announce a new cradle-to-career educational partnership including a state-of-the-art early childhood education center, a new K-12 school and the introduction of an innovative teacher education training modeled after hospital residency programs. The P-20 Partnership – one of the first in the nation – is backed with a $50 million commitment from The Kresge Foundation, marking the largest philanthropic investment in history into a Detroit neighborhood. The investment places education at the center of community revitalization efforts in the Livernois-McNichols district in northwest Detroit. In addition to construction of a new early childhood education center, the Kresge commitment will renovate the former Bates Academy (originally Immaculata High School) on the Marygrove campus to house the K-12 school and will renovate space within the college’s Liberal Arts Building for student and faculty use. This landmark cradle-to-career educational campus – which will offer pre-K through graduate school studies with wrap-around services and community programs – is being jointly developed through a partnership including Kresge, the University of Michigan School of Education (U-M SOE), Detroit Public Schools Community District (DPSCD), the Marygrove Conservancy, Marygrove College, Starfish Family Services, IFF and the Detroit Collaborative Design Center of the University of Detroit Mercy. At full capacity, the new state-of-the-art early childhood education center (operated by Starfish) and the K-12 school (operated by DPSCD) are projected to serve more than 1,000 Detroit children and their families, primarily focused on the surrounding neighborhoods in the Livernois-McNichols district. 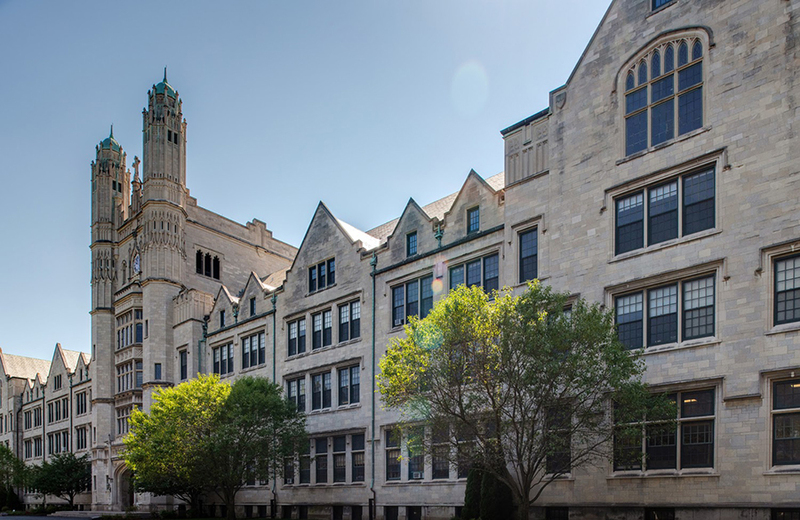 The campus will also offer degree and professional certifications for teacher education students of the U-M SOE and graduate students of Marygrove College, respectively. A new teacher “residency program,” offered by U-M SOE will place undergraduate and graduate student teachers at the DPSCD school. When they complete their degrees, they will work at the school as supervised resident teachers in an innovative program modeled after the way doctors are trained. The first phase of the campus will include a ninth-grade pilot program to open in 2019, followed by the opening of the early childhood education center and kindergarten in fall 2020. Successive grades will be added each year, and by 2029, all grades will be offered, alongside undergraduate and graduate studies and professional development courses and certifications. Detroit Mayor Mike Duggan joined leaders from each of the partnering organizations for the public announcement, where they outlined their collaborative vision for the campus. The group shared how they will engage the community to bring the vision to life, as well as what this investment means for the surrounding Livernois-McNichols district and the city of Detroit’s continued revitalization. The former Bates Academy will house a K-12 school. The P-20 campus announcement comes at a significant time for the northwest Detroit community, following major municipal and philanthropic commitments to the area in recent years. It also follows the announcement last year by the 90-year-old Marygrove College that it would cease its undergraduate offerings due to burgeoning debt and falling enrollment. Leading up to and through that decision, The Kresge Foundation, a long-time supporter of Marygrove College, invested $16 million to help stabilize it, restructure debt, finance academic and campus operations, cushion faculty, staff and student transitions and support the college’s shift to graduate-level education. Kresge then partnered with the college’s founders and sponsors – the Sisters, Servants of the Immaculate Heart of Mary (IHM) – to create the Marygrove Conservancy to steward the campus and its mission. The conservancy immediately began to explore partnerships that could preserve the campus and its historic role as an educational anchor in the city. Duggan praised the P-20 partnership as an example of how the public and private sectors are coming together to provide outstanding educational options for Detroit families. The P-20 campus at Marygrove College is a new approach to economic development centered on educating children and will serve as a model for urban communities around the country. Following Marygrove College’s restructuring, the foundation supported the leadership of Marygrove College; the school’s founders and sponsors, the IHM Sisters; and the newly formed Marygrove Conservancy on the possibility of a consortium of educational institutions coming together to create a P-20 campus model. Similar campuses exist around the country – the Penn Alexander School in Pennsylvania, for example – but none involve early childhood services through graduate level education housed on one campus. Rapson said that the foundation’s $50 million investment in the campus and its work to help engage serious partners in the P-20 concept is on par with lead funding commitments made previously by the foundation to the Detroit RiverFront Conservancy, the revitalization of Midtown, in the creation of M-1 RAIL, and in the “Grand Bargain,” which helped bring Detroit out of municipal bankruptcy in 2014. Echoing the importance of providing a great start for the city’s youngest learners, the P-20 partners announced they will break ground on an early childhood education center on the Marygrove campus in 2019 and open the center the following year. Still in the predevelopment phase and seeking community input, Starfish, DPSCD and the U-M SOE and Marygrove College will codesign the program’s curriculum. The partners outlined their vision for a facility designed to provide full-day, full-year early childhood education services to children ages birth through 5, catered to the whole child and family. Starfish has a rich history in the city, serving thousands of metro Detroit children for 55 years. Led by the Detroit Collaborative Design Center with the support of IFF, existing early childhood education providers in the vicinity are being engaged to collectively develop a set of whole-child and whole-family support principles to envision the early childhood center as a resource for families and other early childhood centers throughout the surrounding area. Following the phase-one ninth grade class initiation in 2019, DPSCD plans to open a kindergarten and 10th grade class in 2020, followed by the addition of another primary and secondary class annually. By 2029, all primary and high school grade classrooms will be staffed and filled; neighborhood families will have priority enrollment. DPSCD and U-M SOE are jointly developing the K-8 and 9-12 curriculum for the schools that DPSCD will operate. Kresge will fund renovations and updates of the district’s former Bates Academy school building, on the southeast corner of the campus, to house the majority of the 1,000 primary and secondary students. Vitti added the teacher-training component has the potential to attract college students to the teaching profession, retain teachers who otherwise leave the profession in large numbers and improve enrollment. The P-20 model has the potential to help the entire DPSCD system as it aligns with the district’s core goals of improving enrollment; improving student achievement, attendance, test scores, graduation rates and college-completion; and teacher development, retention and attraction. University of Michigan President Dr. Mark Schlissel and U-M SOE Dean Dr. Elizabeth Moje outlined their vision for a teacher training school on the Marygrove campus that will be modeled after medical teaching residencies. According to Moje, after completing teaching education studies, new teachers will remain alongside veteran educators in primary and secondary classrooms for three additional years to continue their training while helping newer student teachers learn the profession. Other U-M schools and colleges will join the collaboration as the school and wrap-around services develop. Early partners include: College of Engineering; Stephen M. Ross School of Business; A. Alfred Taubman College of Architecture and Urban Planning; School of Social Work; School of Nursing; and School of Dentistry. Dr. Elizabeth Burns, president of Marygrove College – a college alumna who also attended kindergarten at Marygrove – shared her deep satisfaction that the college’s legacy as a teacher and social justice training center, combined with deep ties to the surrounding community, will continue. Sister Jane Herb, IHM president and Marygrove Conservancy chair, also thanked each partner for their investment in Marygrove College, the Livernois-McNichols district and the children and families of northwest Detroit. A community meeting will be held on October 15, 2018, 6:30-8:30 p.m., in the Marygrove College Main Dining Hall to gain input from local residents as the P-20 campus model is being developed. For more details, call 313-993-1037. Community members will have additional opportunities to engage in the planning process during existing block club meetings, existing community council and association meetings, and stakeholder group meetings as well as two additional community-wide meetings, dates to be announced.